An image composite of Bonang, Naomi Campbell, Helen Mirren and Nomzamo Mbatha. We love getting to see our homegrown icons rubbing shoulders with Hollywood’s heavyweights. In a recent interview, DJ Black Coffee gushed about the opportunity and his experiences working with international household name, David Guetta. Channel24 reports that the jet-setting musician has revealed that it’s been a dream of his to work with Guetta for some time now. Not only that, but he also shared what a great working relationship he has with Diddy. But Black Coffee isn’t the only local star meeting and greeting international stars. 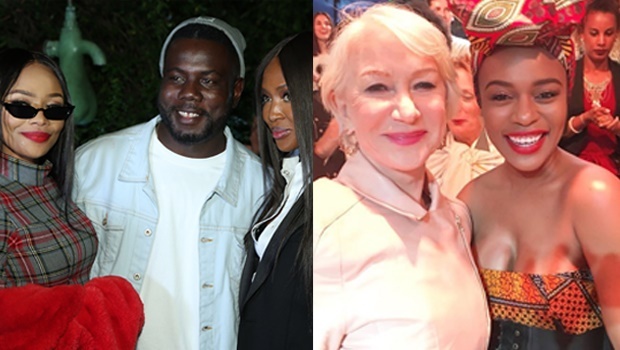 No, Pearl Thusi and Bonang are just a few of our favourite women who are not only slaying at South African red carpet events, but are hanging out with the likes of Naomi Campbell, Shaquille O’Neal and Helen Mirren, to mention but a few. Two queens in one room! Bonang got to hang out with the supermodel at the Global Citizen launch party back in July this year. It was revealed that she'll be co-hosting the event, alongside Naomi and Oprah Winfrey and we couldn’t be more excited. I love basketball. This is monumental for me. ???????????????? . #nbaAFRICA @shaq @nba . Thank you @kwazulunatalfilm for getting me here ?? Local actress Pearl Thusi got to meet legendary NBA basketball player Shaquille O’Neal a few months back when she was in Los Angeles for a brief visit. She attended the NBA All Star Celebrity Games and got to meet Shaq after the games. I don’t think we’ll ever get over tall he is. It’s not every day that you get to meet a legendary Hollywood actress but Nomzamo did just that at the L’Oréal Paris show at the 2018 Cannes Film Festival back in May this year. She fangirls hard over the encounter, calling Helen an icon. We’d be the same, to be completely honest. Is there potential for a collaboration here? We certainly hope so, since it appears that Coldplay’s lead singer, Chris Martin is a fan of Cassper’s music. In a tweet posted a few months back, Cassper reveals that Chris is an incredible human being and that he admires him for helping to make the world a better place. We can definitely get behind a future duet. Also, how chilled does Chris look just hanging out at Cassper’s house like he goes there all the time? Wakanda Forever ??? Had a dope time out at the @nba Dunk Contest with the fam #NBAAfrica rocking that hot @topshopsouthafrica for the win???? DJ and hip-hop artist Ms Cosmo (real name Nonqaba Nozuko Rwaxa) got to meet Michael B Jordan, aka, Killmonger. She also snapped this very cool pic with him. Because if it's not on the gram, did it really happen? Jordan has garnered a reputation for being one of the nicest and most accommodating celebs out there – always making time for fan photos – so it doesn’t surprise us in the least that he’d be up for chilling with one of SA’s most talented spin doctors. No, we’re totally not jealous. Like, at all. Is this hoodie the sweetest present Meghan Markle could ever receive from one of her celeb friends?